The Tampa Bay Buccaneers and a sold out Raymond James Stadium crowd celebrated at halftime on Sunday, observing the 10-year reunion of their 2002 Super Bowl team. They were in no mood to cheer at the end of the game, however, thanks to a stunning comeback by the Philadelphia Eagles that led to a 23-21 win for the visitors on the final play of regulation. Rookie QB Nick Foles led the Eagles on a 64-yard touchdown drive in the final three minutes, converting two fourth-down plays along the way and wining it with a one-yard touchdown pass to WR Jeremy Maclin. The play was reviewed but Maclin was judged to be in bounds as he slid to the ground with the catch. Philadelphia scored two touchdowns in the game’s final minutes, trumping Tampa Bay’s own comeback. The Buccaneers had fired back from a 10-0 halftime deficit to take a 21-10 lead on Doug Martin’s four-yard touchdown run in the fourth quarter. QB Josh Freeman started the comeback with a one-yard TD pass to Mike Williams after a muffed punt by Damaris Johnson, then given the Bucs their first lead with a 13-yard touchdown toss to WR Vincent Jackson. The loss dropped Tampa Bay to 6-7 and put their 2002 playoff hopes in jeopardy. After a four-game winning streak had put the Bucs in the thick of the NFC hunt, the team has dropped three straight, several of them in heartbreaking fashion. Freeman and the Bucs’ offense struggled to find any rhythm in the first half, marking the first time all year that Tampa Bay had been shut out before halftime. With his second-half surge, Freeman finished with 189 yards and two touchdowns on 14-of-34 passing. Jackson caught six passes for 131 yards and Martin had another big day on the ground, running 28 times for 128 yards and his 11th touchdown of the year. One more dose of Martin could have put the game away after Clay Harbor’s touchdown catch with four minutes left. However, a particularly painful holding penalty put the Bucs in a hole on the ensuing drive and Philadelphia got the ball back with almost three minutes left, which proved to be enough time for the final comeback. The Buccaneers also missed another opportunity to clinch the victory when CB Danny Gorrer dropped a potential interception with less than 30 seconds remaining in the game. Foles followed that play with a 22-yard completion to Jason Avant on fourth-and-five, and the Eagles’ offense was able to spike the ball with two seconds left on the clock. Tampa Bay’s top-ranked rush defense was dominant once again. 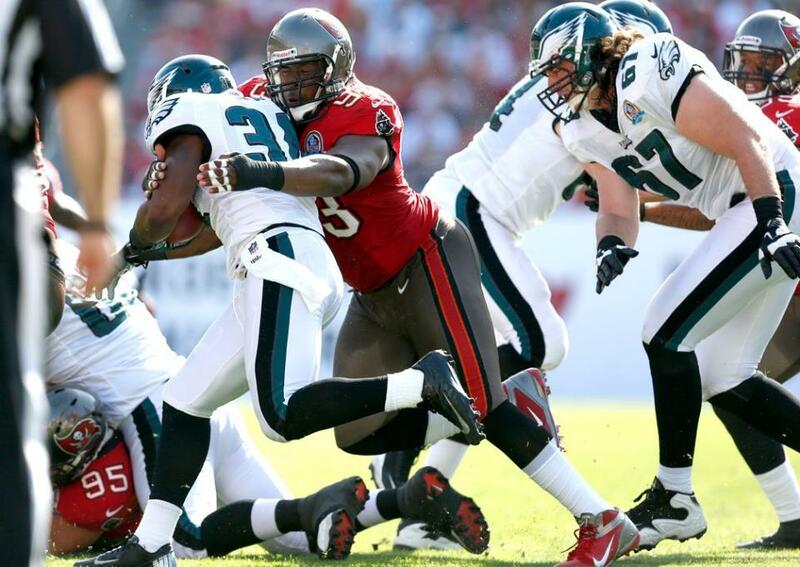 Facing a running back in Bryce Brown who had blasted for 347 yards and four touchdowns in the Eagles’ previous two games, the Bucs held Philly’s rushing attack to 29 yards, including 27 yards on scrambles by Foles. Brown was held to six yards on 12 carries. That complete shutdown of the Eagles’ rushing attack should have allowed the Buccaneers to tee off on Foles, the third-round rookie making just his third NFL start. And, indeed, Tampa Bay’s defense racked up a season-high six sacks, two each by Gerald McCoy and Michael Bennett. However, Foles handled the pressure quite well, completing 32 of 51 passes for 381 yards, two touchdowns and no interceptions. He was masterful on the final drive, converting two fourth downs, one on his own scramble and another third down with a 23-yard pass to Maclin. The Buccaneers’ defense was dominant to start the game, holding Philadelphia to negative-six yards on 10 plays on its first three drives. However, the Bucs’ offense didn’t take advantage and the Eagles eventually took a 10-0 lead on an Alex Henery 28-yard field goal and Foles’ own 10-yard scramble. McCoy added five tackles, three tackles for loss and three quarterback hits to his two sacks, and Bennett had four tackles, four tackles for loss and four QB hits. The Buccaneers, who lead the NFL in tackles for loss, had another 10 on Sunday, including one each by Ronde Barber, Leonard Johnson and Daniel Te’o-Nesheim. Rookie LB Lavonte David had nine more tackles plus his first career sacks. A third-down sack by McCoy, his fourth of the season, forced a Philly three-and-out to start the game. The Bucs’ first drive after a 66-yard punt by Mat McBriar opened with a miscue, as an attempted handoff by Freeman to Martin ended up on the ground. The rest of the drive didn’t go any better and the Bucs quickly punted it back. DEs Da’Quan Bowers and Michael Bennett combined to trap Brown in the backfield for a loss of four on the first play of the ensuing drive, and the Eagles were forced into another quick punt. Almost immediately, Freeman took a shot deep downfield, but when it was five yards too long for Jackson, the two had to combine on a third-and-10 out that picked up 19. Two tough Martin runs up the gut made it third-and-three at the Philly 39, but an attempted out to Williams was incomplete and another punt followed, this one fair caught at the Eagles’ 14. Philly got its first first down to start the next drive on Foles’ 10-yard pass to WR Riley Cooper. Foles tried to go right back to Cooper on the same sideline on the next play but CB E.J. Biggers was there to bat it away. On third down, the defensive line collapsed on Foles and Bennett got the 10-yard sack at the Philadelphia 15. Once again, the Bucs’ offense got just over midfield and then sputtered, with a third-down crossing route to Clark coming in a bit too high and leading to the game’s sixth punt, with 3:30 still left in the first quarter. A great scrambling throw by Foles to Cooper converted a third down and picked up 16 yards to the Philly 41. However, a great open-field tackle by Gaitor on the next third down led to yet another punt. That pattern continued into the second quarter, when Parrish gave the Bucs’ outstanding field position with a weaving 30-yard punt return to the 48-yard line. However, T Demar Dotson drew a holding penalty on the first play and once again the drive went nowhere, although a deep post downfield to Williams nearly came up big. A facemask penalty on the Bucs’ next punt allowed Philly to penetrate Bucs territory for the first time, and that turned into the game’s first points. WR Jason Avant made a stunning, one-handed catch of a desperation heave on third-and-17, leading to a first down at the Bucs’ 20. Brown’s first good run of the game picked up 11 yards to the nine, but the Bucs brought the heat on the next three plays and Foles never got close to completing a pass. The Eagles opened the scoring on Alex Henery’s 28-yard field goal. Clark held on to a 17-yard pass despite taking a huge hit from CB Dominique Rodgers-Cromartie to get the next drive started. That was about all that went right on the march, however, and Michael Koenen’s sixth punt of the half followed. The Eagles faced a third down at midfield but Foles escaped a sack and found Avant wide open deep down the right sideline for a gain of 39. On the next play, the Bucs’ defense was fooled by a play-action fake and the right end was left wide open for Foles to run it in for a 10-yard score and a 10-0 Eagles lead. A 25-yard pass down the right sideline to Jackson gave the Bucs another crack near midfield, but Freeman was sacked on the next play for a loss of eight. Another shot downfield to Williams missed and then a second sack ended the drive. The Eagles got close enough in the closing seconds to try a 58-yard field goal, but Henery just missed. The Bucs got the ball to start the second half and looked much sharper. A 17-yard crossing route to Underwood and a leaping 13-yard catch by Williams got the ball across midfield. This one stalled just past midfield, too, but the Bucs got the ball back on special teams when return man Damaris Johnson muffed Koenen’s punt while trying to make a fair catch. LB Dekoda Watson recovered for Tampa Bay at the five and, three plays later, Freeman threw a one-yard TD pass to Williams. It was an exceedingly simple play, as Williams basically just ran a buttonhook in front of the defender, walling him off and catching Freeman’s purposely high dart. McCoy burst right through the line on the next play from scrimmage to bury Foles for a loss of eight, but two plays later Foles got free and scrambled for 14 yards. He then found Avant again on a crossing route and hit him for a 23-yard gain to the Bucs’ 21. A third-down pass over the middle to Clay Harbor came up two yards short, however, and Henery came on to attempt a 31-yard field goal. Henery hooked it wide left and the score remained 10-7 in Philadelphia’s favor. An exchange of punts put the ball at the Bucs’ 23. Freeman’s 38-yard post pass to Jackson got the ball into scoring territory, and two plays later he hustled downfield to throw a key block on a nine-yard reserve-field run by Martin. Martin also ran for two to convert the ensuing third-and-one, absorbing a facemask penalty that moved the ball down to Philadelphia’s eight-yard line on the final play of the third quarter. Two plays after the teams switched sides, Jackson scored the go-ahead score. Freeman dropped back and waited as Jackson started from the middle of the field out then suddenly pivoted back in, then delivered the perfect pass to hit him in stride. Jackson dived between two defenders and over the goal line to give the Bucs their first lead of the day. The Bucs’ defense followed with the three-and-out the team needed, with CB E.J. Biggers breaking up a third-and-eight pass intended for Maclin. Now with the lead in hand, the Bucs turned to Martin to grind out yards and the clock, and he started the next drive with two pitch-sweeps left for a total of 18 yards. Three plays later, Freeman shot straight forward out of the backfield to scramble for 13 yards, converting a third-and-nine and putting the ball in Philly territory. On the next third down, Freeman and Jackson hooked up again on a quick slant and the receiver broke away from CB Nnamdi Asomugha to gain 28 yards to the Philly 12. Martin did rest, running up the gut twice to make it third-and-two, then slicing over left tackle for the four-yard score. The Eagles didn’t go quietly. Foles completed passes of 24 and 22 yards to Maclin, the latter converting a third-and-10 in Tampa Bay territory. On third-and-seven from the 11, Foles scrambled out of the pocket to the right and eventually threw a back-of-the-end-zone touchdown pass to Harbor. With four minutes left on the clock, the Eagles went for two but failed thanks to a near-sack by Te’o-Nesheim. Martin ran for one first down to start the next drive, but a holding penalty on Ted Larsen killed the drive and kept the Bucs from running much time off the clock. Philly got it back at its own 36 with 2:44 remaining. Bennett’s second sack put the Eagles in a quick hole, but Foles converted a third-and-14 with a 23-yard pass to Maclin. Later in the drive, Foles also kept it alive with a three-yard scramble on fourth-and-one, taking it down to the Bucs’ 23. On the ensuing third down, Foles threw a pass that was nearly intercepted by Gorrer, but dropped. That gave Foles another chance, and he threaded a 22-yard pass to Avant down to the one-yard line. The Eagles were able to spike the ball and kill the clock with two seconds left, allowing for one more play. On the snap, Foles sprinted to his right and threw a touchdown pass to Maclin, who just stayed inbounds as he slid to the ground with the game-winning score.